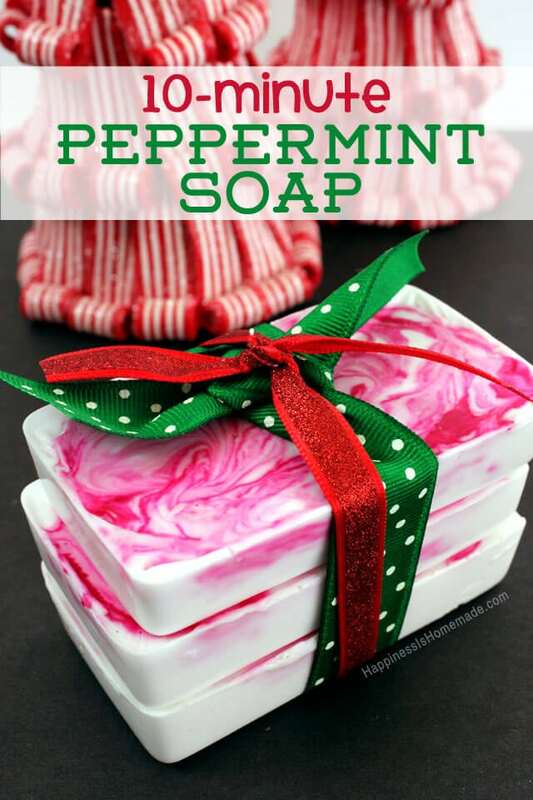 These lightning-quick peppermint soaps are a fun DIY holiday gift idea for friends, neighbors, and teachers that can be whipped up in just ten minutes! The large block of shea butter soap base is smooth and silky, and it cuts easily with a kitchen knife. 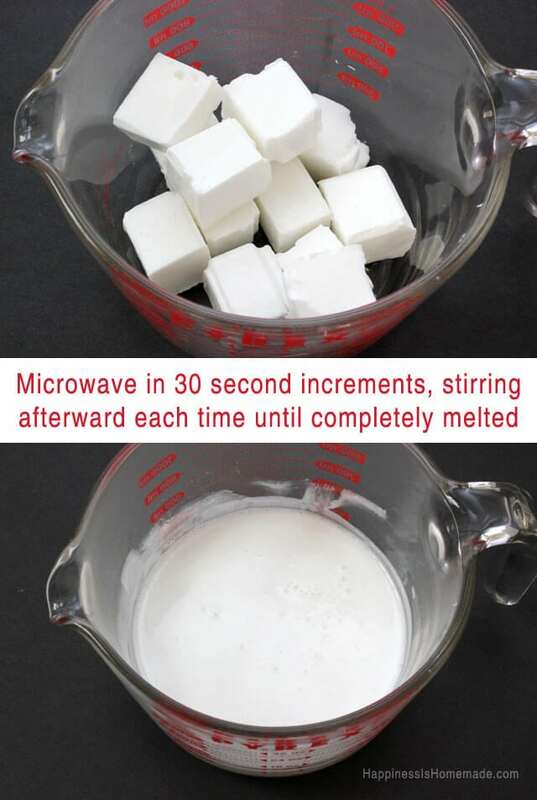 Slice the soap base into cubes, place them inside the measuring cup, and melt in the microwave in 30-second increments. Stir well after each microwave session to ensure that the soap is completely melted. Add a few drops of peppermint oil (around 6-10 drops depending on the intensity of the fragrance) and mix well. 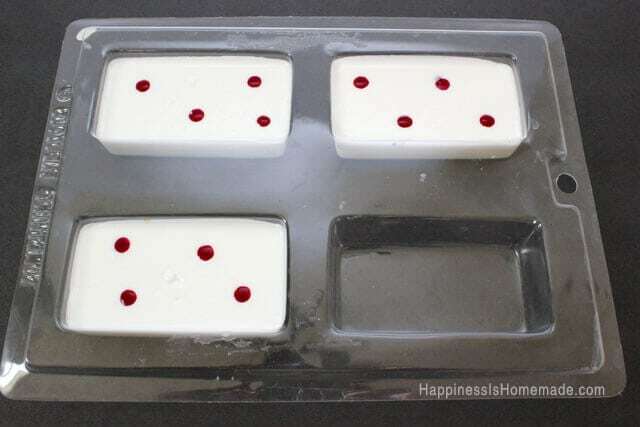 Pour the melted soap into the mold and top with a few drops of red soap colorant. Use a toothpick to swirl the white and red colors together, and allow to cool completely before removing the soap from the mold. 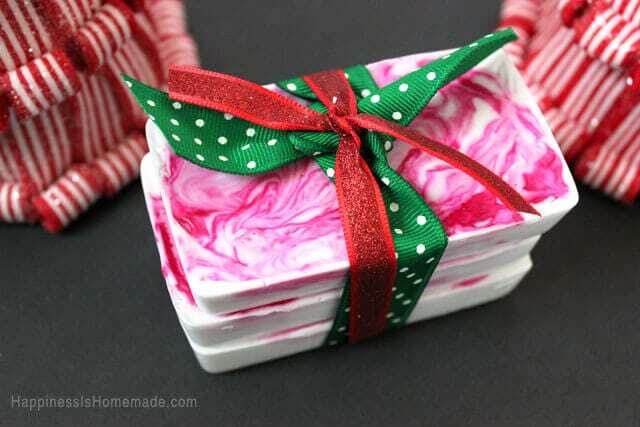 Wrap a band of paper or ribbon around the stack of soap, and it’s ready for gifting! If you love this idea, be sure to check out our other quick and easy bath & body products as well! I love this idea Heidi! Does the Red soap colorant come off on your hands when you use the soap? Is the Shea soap base bars of soap you can buy off the shelf or is it a speciality thing. If it is a speciality thing where can I get it? Where can I find these ingredients?? how much does a batch make? I am curious…can you use a cocoa butter soap base instead of the shea butter base?? Does the difference in consistency between those two bases make a difference in the final product given these measurements?!? You don’t give any measurements on the Shea butter or the oil, how much of each? Since I don’t have a microwave, what would be the best way to melt the Shea soap base? beautiful i’d love to make for christmas gifts but where would you find the shea butter base and more importantly the molds? There are a number of websites to buy the soap base and the molds, and it’s cheaper than going to Michael’s or other craft shops. You can try Wholesale Supplies Plus, Bulk Apothecary, Peake Candle &Soap supplies, Wellington Fragrance, Bramble Berry or just type in Amazon or Ebay “soap making supplies. Also, the mold this person used, I believe, is a 5oz mold. I have the same one. Isn’t it nice we have such talented people who share such cute ideas! I love it and it seems simple enough. There again I guess I can change the color and fragrance to use for mother’s day just for those who may not receive a gift but have been gracious to us! There are so many ways we can brighten folks lives. Thanks for sharing. How long will the soap keep? I want to make it this weekend and use as gifts through Thanksgiving and Christmas. Hi! My first grade students are going to be making a craft to sell to other students in our grade-wide economics sale. We are supposed to choose a craft that makes 250 of something. If I got a smaller size to make the soaps (I’m thinking like a mini muffin tin) how much soap base would I need? I just want to make sure this is affordable for me but I LOVE this idea! Could you use regular food color instead? From my experience, food coloring will not work as well. It will color the soap, but it takes a large amount of food coloring for it to become saturated enough, and you run the risk of the dye transferring to your skin when the soap gets wet. is there any specific technique, pattern or anything you do when swirling the color onto the soap with the toothpick to make it come out super pretty? 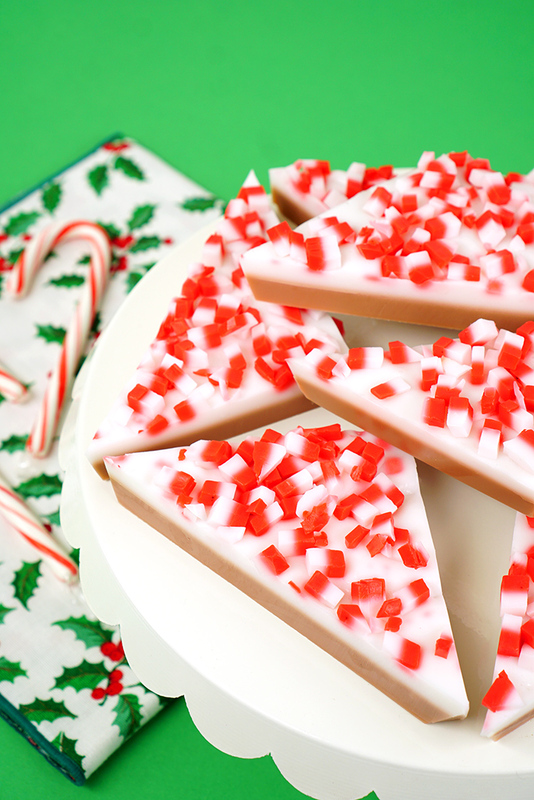 I love this idea, I can’t wait to try it for Christmas. is It ok to use a premise soap like unscented Dove? I do not think that Dove soap will melt in the correct way for this project. How much soap does this make?